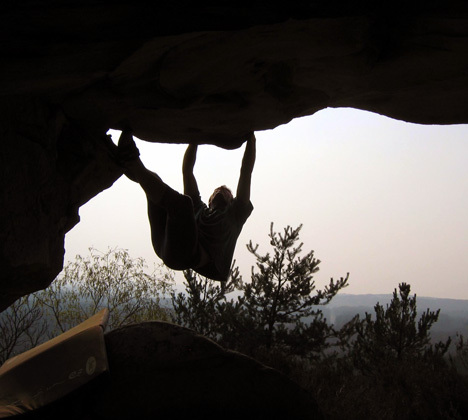 This small area, discovered early by Jean-Claude Valluet and Max, has been completed recently and now proposes about 30 problems between 5a and 7b. Access : park the car on the D409 (between Milly-la-Forêt and Arbonne) at the crossing with La Route de la Croix Saint-Jérôme. Climb the slope in direction of the North (no evident path) to find the boulders, under the crest. Other recent boulders are located next to houses : it is asked not to climb them during week-ends or holidays. NB : please, do not park the car on Le Chemin des Grandes Vallées (Chemin des 100 marches), because it leads to dwellings.